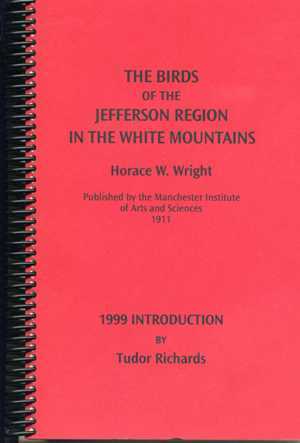 The Birds of the Jefferson Region in the White Mountains, by Horace W, Wright, 1911. New reprint of fascinating study of birds in the northern White Mountains. Each species has an individual account. Includes an informative introduction by NH bird authority Tudor Richards updating the status of many species through 1999. A treasure trove for White Mountain birders. 175 pp, spiral bound, 6" X 8 1/4".